"I highly recommend�The House Floral Design�as the staff are so friendly and helpful and their floral arrangements are absolutely beautiful.�The Christmas wreath workshops were excellent." "I highly recommend�The House Floral Design�to all Local Mums.�Vanessa is amazing. I'm a wedding make up artist and have done lots of weddings with Vanessa and can thoroughly recommend her." 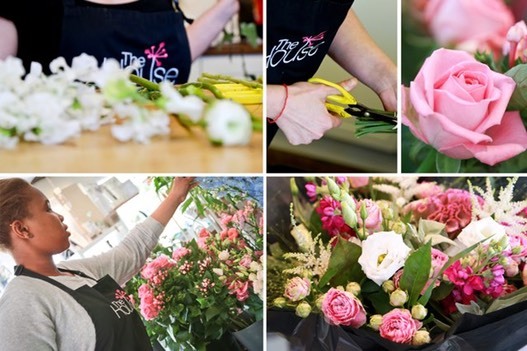 "I highly recommend�The House Floral Design�to all Local Mums. I used them for my own wedding and the flowers were beautiful. I have also used them for funerals for relatives. My husband is a wedding photographer and works with them often; they are always excellent." "I couldn't recommend�The House Floral Design�more highly to Local Mums. Not only because they did my wedding flowers which were beautiful and not anything like as expensive as I thought it would be, but because of this story...I was in there on Valentine's Day a couple of years ago and a teen lad came in and asked them to do a bouquet for him. He only had a fiver. They did him a lovely bunch of flowers. He was made up. Don't know if they were for his mum or his girlfriend but they got a lovely prezzie!" "I recently had the pleasure of attending a workshop at�The House Floral Design�in Carshalton Beeches. This particular workshop was to make a�Christmas door wreath, in our case a balcony wreath, and though I am not�particularly good at creating things, I ended up taking home a lovely wreath�and more importantly, having really enjoyed my evening!�This is not the first time we, as a family, have enjoyed the workshops run by�The House Floral Design. My daughter has made a Christmas table centre, she and her�daughter enjoyed pumpkin carving at Halloween and my granddaughter had a�lovely time creating a beautiful offering for Mother’s Day – and I am very sure�it will not be the last time we enjoy them. The workshops are run at different times during the year (to celebrate/take advantage�of different events) and you can either go along as an individual or go along�with a party…children or adults or both! Vanessa and Lucy and the team at�The House Floral Design�make it a really fun evening/daytime event and even if you are not�artistic you come away with something lovely…I thoroughly recommend�The House Floral Design�for its workshops, the lovely flowers you�can buy there and its great giftshop." Looking after our local clients as well as those nationwide. We provide Fresh Flower Bouquets, Vase Arrangements, Wedding Flowers,�Corporate Arrangements, Sympathy Tributes, Plants and Unusual Gifts,�Potted Arrangements, Plants, Balloons and Seasonal Gifts. Our shop provides a �welcoming experience for its customers. We also run fun after-work floral workshops throughout the year. Delivery areas covered Carshalton Beeches, Carshalton, Wallington, Sutton, Cheam, Banstead, Belmont, Morden, Hackbridge, Beddington, Epsom, Croydon, Kingswood, Worcester Park, Ewell, Wimbledon, Raynes Park, Tolworth, Kingston, Warlingham, Caterham. National and International via Interflora. Come and visit you won’t be disappointed.